Floyd Mayweather, Jr., an undefeated American boxer, who is considered by many as an all-time-great fighter in the world, has no intention to fight his top contender Manny Pacquiao. Yes, it looked as though he was contented to handpick his opponents. He was satisfied to give lessons to the neophytes in boxing. He didn’t even care if people called him “Duck.” Duck means ducking Pacquiao. A few years ago Mayweather said he would beat Pacquiao so easily. He even gained more confidence after he defeated Juan Manuel Marquez. It was a clear decision win by American fighter. However, boxing pundits and pugilists questioned the credibility of Mayweather when he was scared to fight the Filipino icon. For many people, he was always a cherry picker, because the bout against Pacquiao already happened long time ago if he had no many excuses. The question now by boxing aficionados, why everyone is afraid to fight Manny Pacquiao? 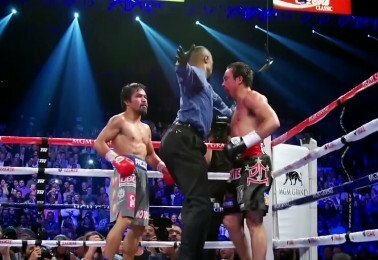 Even Marquez who was not scared to make war before against the Filipino boxing superstar, now seems his legs are shaking when Pacquiao’s camp wants to have a rematch. Marquez was a brave fighter before, but now he seems he is frightened and has no interest for a fifth tentative bout. What happened to the Mexican Warrior? Now, most boxing fans around the world believe it was a “Lucky punch” that knocked Pacquiao out. Marquez already knew that if he would fight Pacman again, the Filipino fighter would surely avenge his loss. That’s why no second chance for him. Indeed, both Mayweather and Marquez are scared of Pacquiao. That’s why they have a hundred of excuses not to meet the Filipino congressman. Pacquiao, on the other hand, is waiting to fight one of them; whoever is brave enough to take the challenge. Pacquiao wants to show the world that his defeat against Marquez was a stroke of luck. He wants Marquez as his next opponent, but Marquez is ducking him. He also wants to end the talks about a possible dream match against Mayweather. It’s true that Pacquiao has done everything to make the sport of boxing exciting and thrilling to watch. In other words, if there will be no Mayweather or Marquez fight, Pacquiao has no choice but to choose between Timothy Bradley and Ruslan Provodnikov. We have been yearning for Pacquiao-Mayweather fight for years, as it’s considered as one of the biggest fight in the sport of boxing. But we are disappointed. Let’s just accept the reality that this mega fight is not going to happen anytime soon if there is no real talk between the two parties. You are here: Home / Boxing News / Mayweather And Marquez Are Both Scared Of Pacquiao?